Orbital Sciences Corp. announced Tuesday it selected United Launch Alliance’s Atlas 5 rocket to launch a Cygnus space station resupply mission in late 2015 while the company redesigns its Antares booster with a new engine following a catastrophic failure seconds after liftoff in October. The Atlas 5 launcher will take off from Cape Canaveral’s Complex 41 launch pad to send Orbital’s Cygnus supply ship on a trek to the International Space Station. 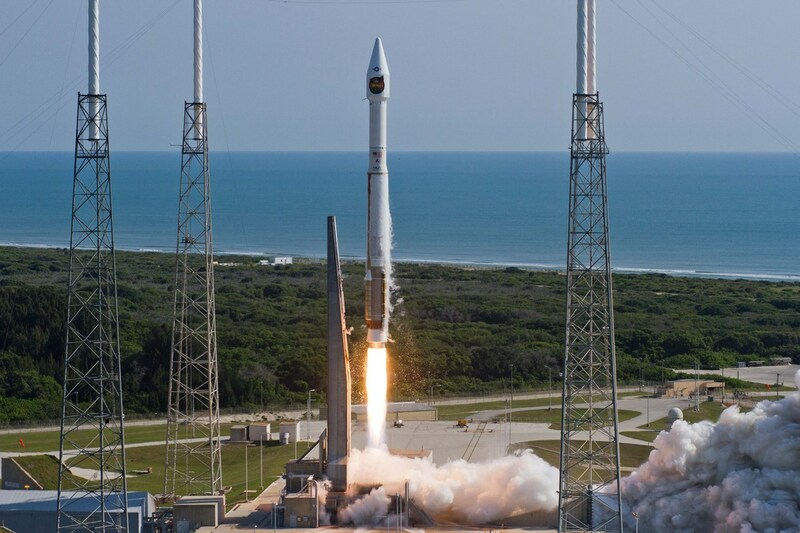 The flight is scheduled for the fourth quarter of 2015, Orbital Sciences said in a statement. 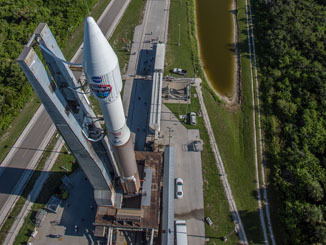 The Atlas 5 rocket will fly in the “401” configuration with a four-meter diameter payload shroud covering the Cygnus spacecraft, no strap-on solid rocket boosters, and a single-engine Centaur upper stage, according to ULA. Financial terms of the contract were not disclosed by Orbital or ULA. Orbital officials said in November they were was considering two U.S.-based launch companies and a European launch provider — believed to be ULA, SpaceX and Arianespace — for at least one Cygnus mission in 2015. Orbital hopes the redesigned Antares rocket — with a new first stage propulsion system — will be ready to begin flights in the first quarter of 2016, the company said Tuesday. Officials decided to switch out the Antares rocket’s first stage engines in the wake of the Oct. 28 explosion, which destroyed a Cygnus cargo craft heading for the space station and damaged Antares launch facilities at NASA’s Wallops Flight Facility on Virginia’s Eastern Shore. Investigators said the Oct. 28 failure originated in the turbopump machinery of one of the booster’s AJ26 main engines, which were manufactured in Russia in the 1970s for the Soviet Union’s N1 moon rocket. The engines — known as NK-33 engines in Russia — were kept in storage until the 1990s, when Aerojet Rocketdyne purchased the powerplants and imported them to the United States for use on American launch vehicles. Artist’s concept of an enhanced Orbital Sciences Cygnus spacecraft approaching the International Space Station. Credit: Orbital Sciences Corp. The Dulles, Va.-based company’s contract with ULA includes an option for an additional Atlas 5 launch in 2016 if the upgraded Antares rocket is not ready to resume flights. The switch to a new engine and price of purchasing an unplanned Atlas 5 launch will come at no extra cost to NASA, according to Orbital. Orbital Sciences has not identified the new propulsion solution for the Antares rocket, but Russian news reports last month said the RD-193 engine — a single-nozzle kerosene-fueled engine made by NPO Energomash of Khimki, Russia — was Orbital’s likely choice. Two RD-193 engines mounted on the bottom of the Antares rocket’s first stage would give the launcher extra thrust to lift heavier payloads into orbit, officials said. Orbital has not confirmed what engine it selected. The next Cygnus flight will be the craft’s first mission in an “enhanced” configuration with new power-generating solar arrays, an extended pressurized cargo compartment, and lighter structural components help it take up more supplies to the space station. 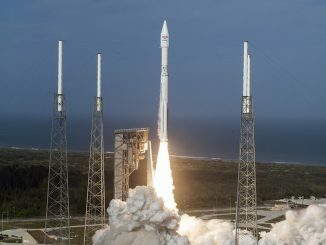 With the selection of the Atlas 5 rocket, plus the higher cargo capacity available on the upgraded Cygnus spacecraft, Orbital plans to meet its contractual commitment to carry up at least 20 metric tons, or about 44,000 pounds, of supplies and experiments to the International Space Station in seven flights. 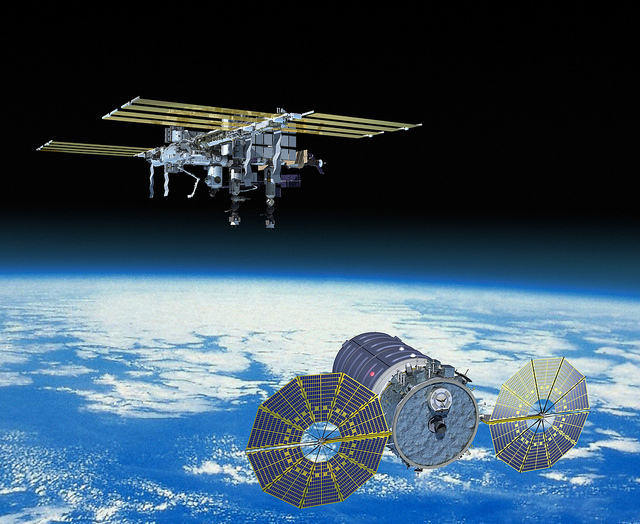 Orbital’s $1.9 billion space station resupply contract with NASA originally called for eight launches. The Atlas 5’s lift capability will allow the Cygnus spacecraft to haul 35 percent more cargo than possible if the supply ship flew on the less powerful Antares rocket, according to Orbital Sciences. 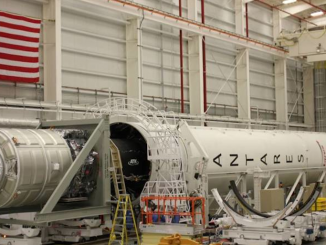 Three flights of the modified Antares booster with new engines are scheduled for the first quarter, second quarter and fourth quarter of 2016 from the Wallops launch base in Virginia, Orbital said. Orbital Sciences is bidding for a new round of cargo contracts to be awarded by NASA in March or April.